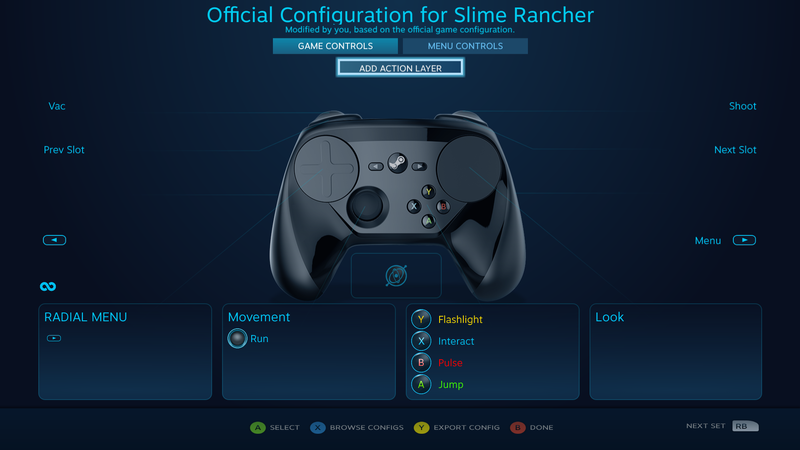 A radial menu is an on-screen overlay of game actions, displayed as a ring of choices selectable with a controller. 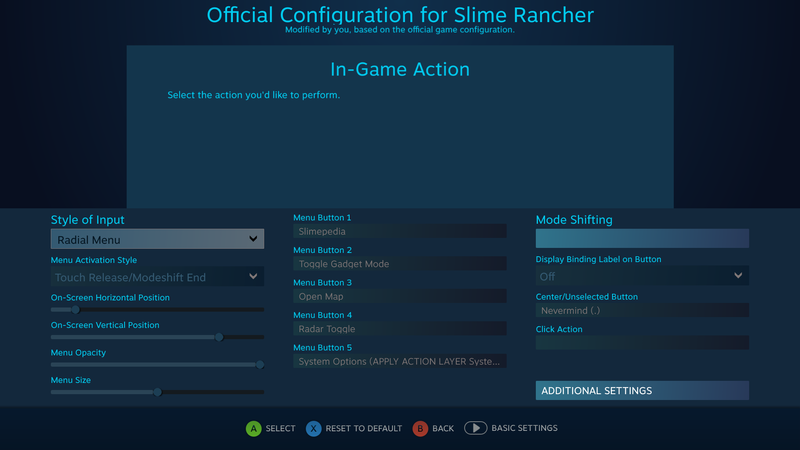 These are very similar to Touch Menus, except that instead of selecting a specific location on the touch surface, the player must aim the virtual pointer at the option they want and then select it to fire the action. You can use these to e.g. 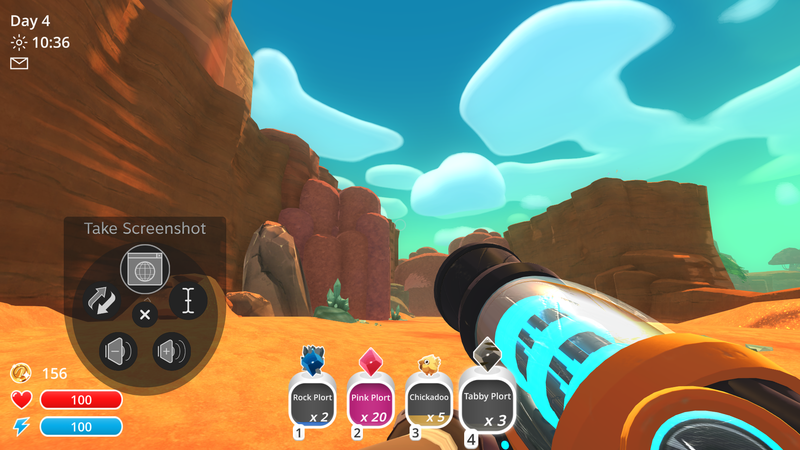 switch weapons in a first-person shooter, toggle hotkeys in a real-time-strategy game or MMO, or any other use you can think of. Radial menus can be configured in many different ways in both behavior and appearance, and can be adorned with custom labels and icons (provided by either Valve, the developer, or the player). 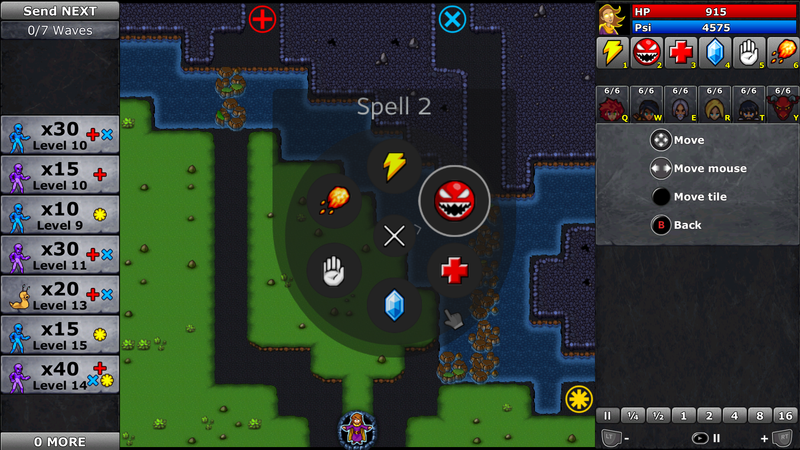 That radial menu in the center of the screen is not part of Defender's Quest's code. 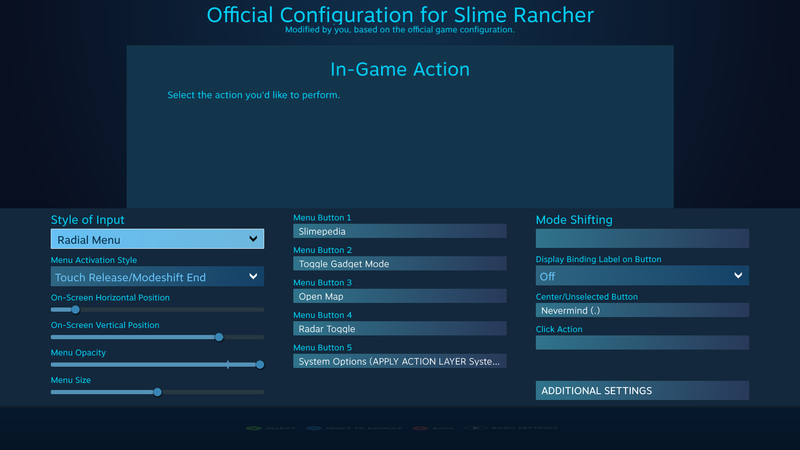 It's entirely driven by the Steam overlay and the Steam Input configurator. As far as the Defender's Quest application is concerned, it's simply receiving actions from the Steam Input API. 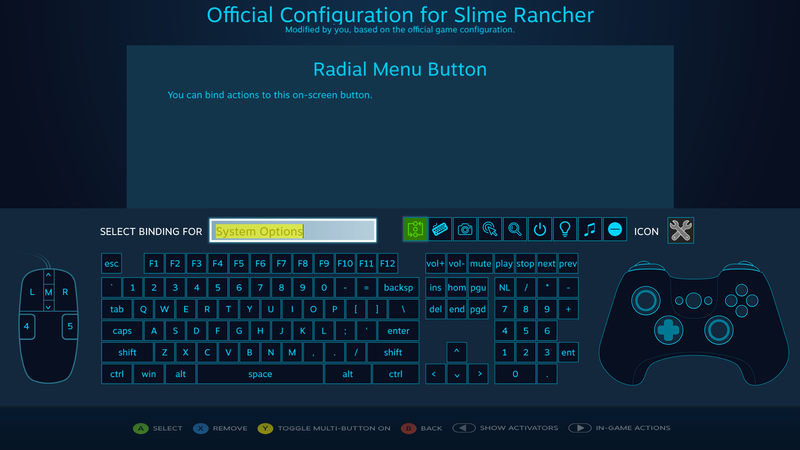 To create a radial menu, simply select a compatible input source in your game's configuration (such as a joystick or trackpad), and select "Radial Menu" as the input style. 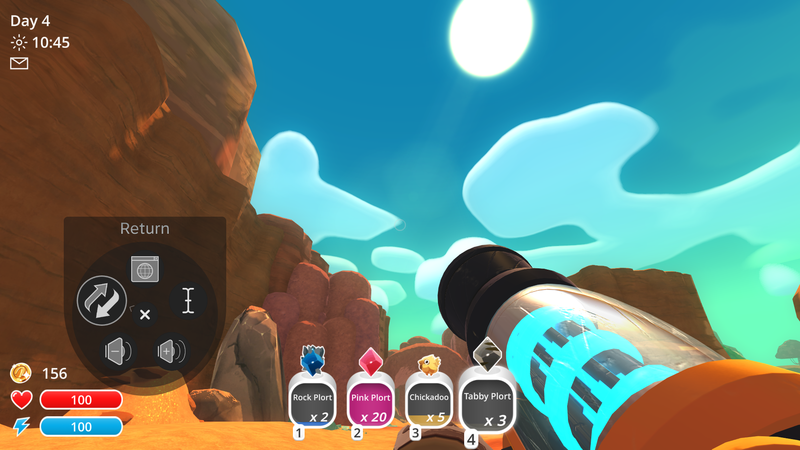 This determines how the radial menu works -- should the action fire when you point at it and let go, must you click something first, or should it continuously fire as long as it's highlighted? Touch Release/Modeshift End Highlighted action fires when input stops (such as releasing a button or lifting your finger off a trackpad/joystick) or, if the radial menu is on a modeshift, whenever that modeshift ends. On-Screen Horizontal / Vertical Position Where should the radial menu appear on-screen? Values are 0.0-1.0, with zero representing the left/top edge of the screen, and one representing the right/bottom. Menu Opacity The radial menu has a black background and you can control its transparency. The action icons themselves will always appear with 100% opacity, however. Menu Size How big is the menu? A scale factor between 0.0-1.0, from smallest to largest. Display Binding Label on Button Radial menu buttons can show a text label of what is bound to them on the actual button. If an icon is used, this label will display in the upper left corner. If disabled, the icon or blank button will be used. Click Action This is an action that is not bound to any particular input, but instead to the radial menu itself. This is particularly useful when combined with the "Always On" menu activation type. 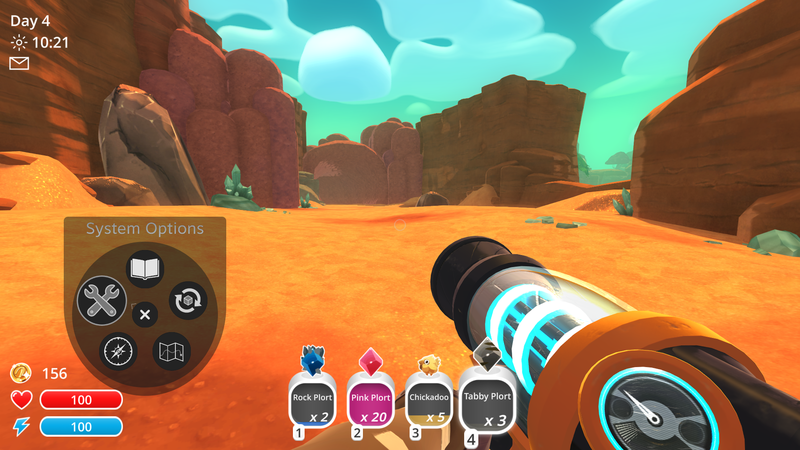 A natural example is binding this to "pause," so that whenever you bring up the radial menu, the game pauses and you have time to make your choice. Each "Menu Button X" option can have an action (and/or legacy key binding) assigned to it. 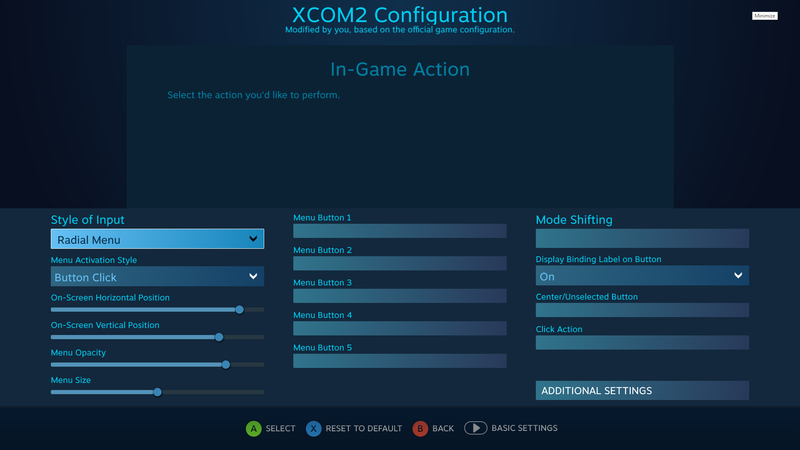 The basic configuration screen has five menu buttons, but you can assign up to twenty (select "Additional Settings" for bindings for menu buttons 6-20). There is also an optional "center" button in the center position of the radial menu that is bindable just like any other radial menu button. Note that this button will grow in size as you add more regular menu buttons. Depending on your game, you might want the player to easily be able to back out of the radial menu without activating anything. If you are using the "Touch Release/Modeshift End" activation style, this can be tricky because whatever action you have selected last will immediately fire when you close the radial menu. One particularly nice way to do this is to create a completely unused action in your game (call it "nevermind" or something), and bind it to the center button. Or, if you're the player and the developer hasn't provided such an action (or you're in legacy mode), bind the center button to some legacy key that the game ignores. Then, choose a nice "X" for this menu button. Voila! Now whenever you want to dismiss this kind of radial menu without committing to an action, you just return to the central rest position and release the input. By default the icons are provided by Valve from the steam client itself. 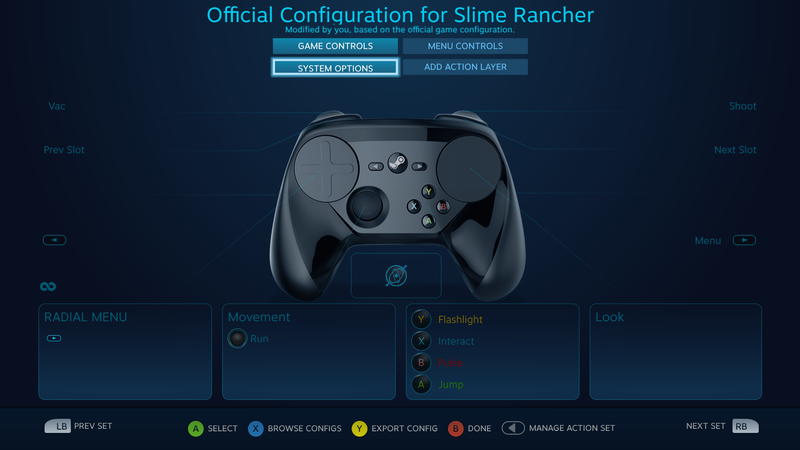 You can find these in <SteamInstallDirectory>\Steam\tenfoot\resource\images\library\controller\binding_icons (and if you add your own here, they will appear in this menu, though only on your own local computer). 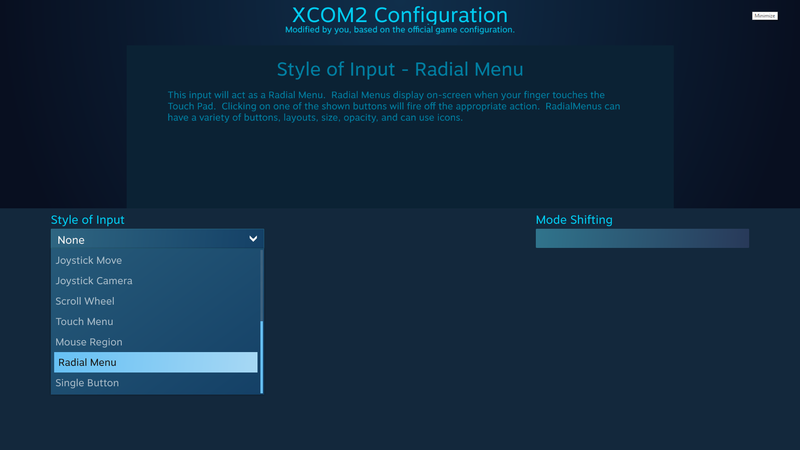 Developers can provide their own custom icons for use in radial menus (and touch menus) by placing *.png files in a directory named /TouchMenuIcons, relative to their game's root directory. Animated GIFs can be used as custom menu icons! You can use Action Set Layers to created Nested Radial Menus. 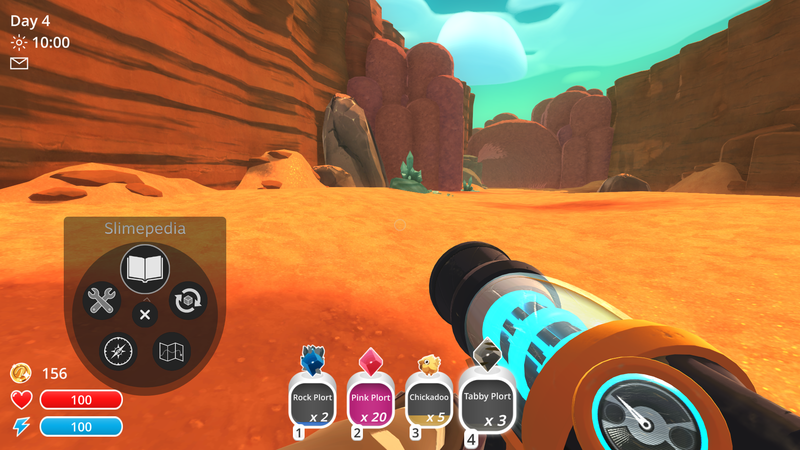 We'll provide an example using the game Slime Rancher. Here's how we set it up. 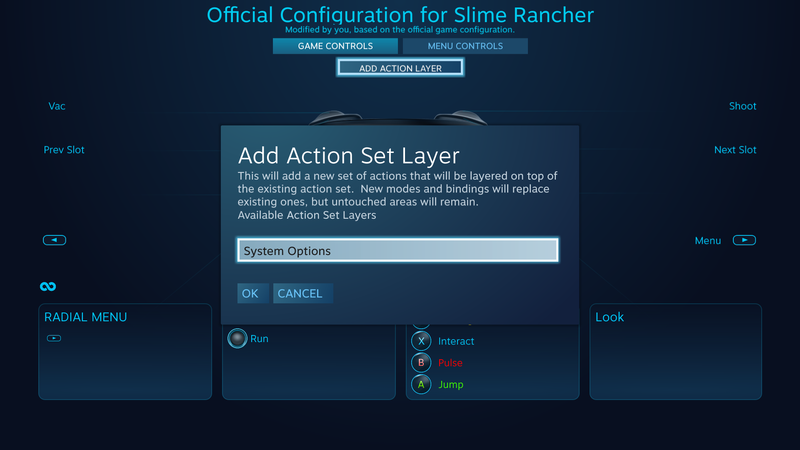 First, we create a custom action set layer. We click "add action layer." We'll call it "System Options." 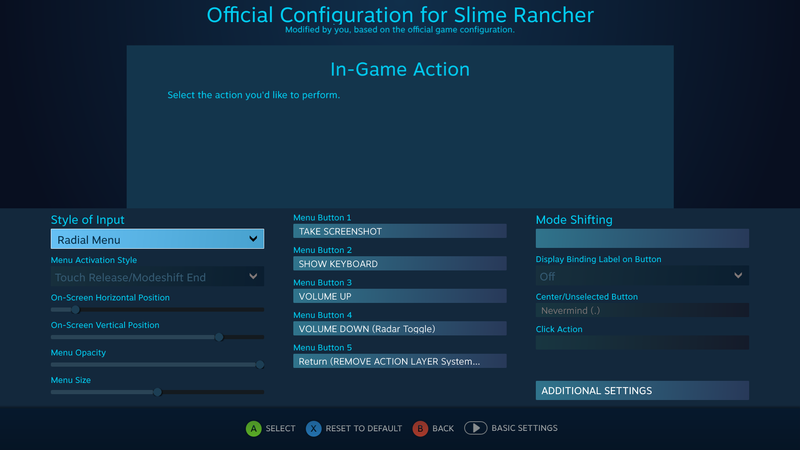 Note that the special "action set" button will not appear in the binding menu if you don't have any custom action sets defined. This means that you must create your custom action set layer before you try to set up the activation toggle for it. See the Action Set Layers article for more info on creating action set layers. And there you have it! A double-layered radial menu.